I don’t have any flowers blooming right now, but I miss flowers and decided to go back into my archives and remember how very much I loved my fuchsia. I’ve been reprocessing them since I now have a lot more filters than I had when I first got these pictures. As a bonus, there were pictures in there I’d never really looked at before. Actually, there are a lot of pictures in these folders I’ve never used at all. More fuchsia and a little green bug! And from now to the end of the month, it will be fuchsia. I have a lot in different colors, at different stages of development … and I love them. It is Primary Election Day here in Massachusetts. If you happen to live here, please vote. It couldn’t be more important than it is today. Right now. More flowers today. 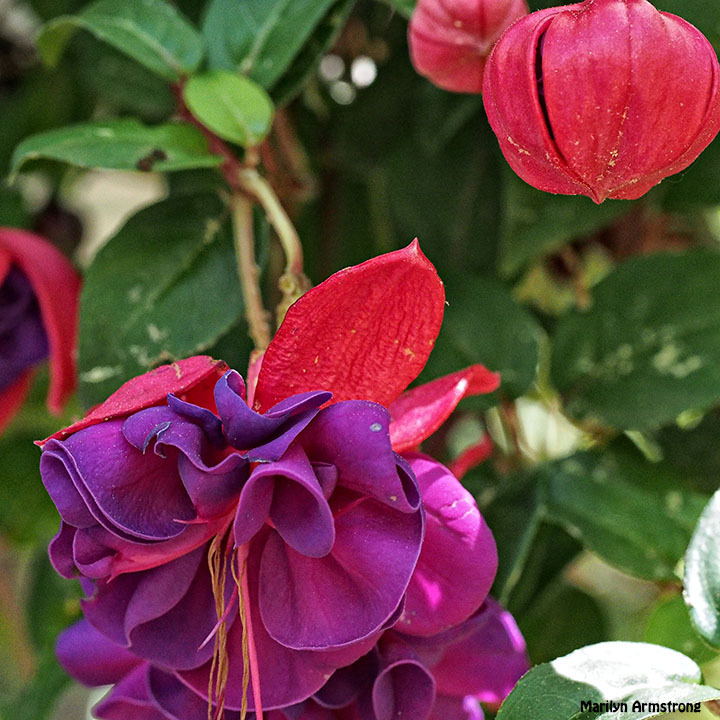 Fuschia, from when they were still selling fuchsia. I have so many flowers in pink! It’s probably my favorite flower color so you will have to forgive me my pink floral passion. Yesterday afternoon, I could see treetops in motion. You’d be surprised on how rarely that happens. Most wind whips across the lawns, but when the tops of the big oak trees start to sway, there’s a stronger wind high up. The remnants of Hermine, the almost-a-hurricane is currently traveling up the Atlantic coast. Some wind, but nothing dangerous. 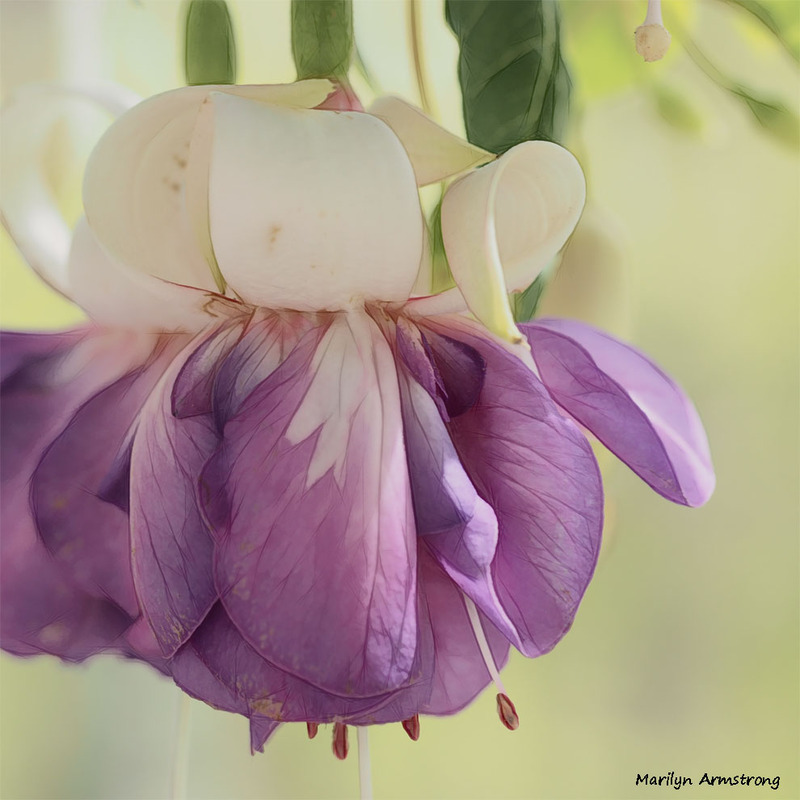 Just enough to go outside and take the fuchsias down from their hooks. Turn the chairs upside down. We have a lot of glass and I’d rather not invite flying chairs. It may not happen, of course. 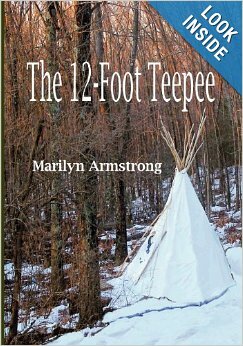 The paths of tropical storms, especially in these northern latitudes, is unpredictable at best. I’m hoping for a light grazing by storm. We need the rain and if we have to take a little wind as part of the package, so be it. 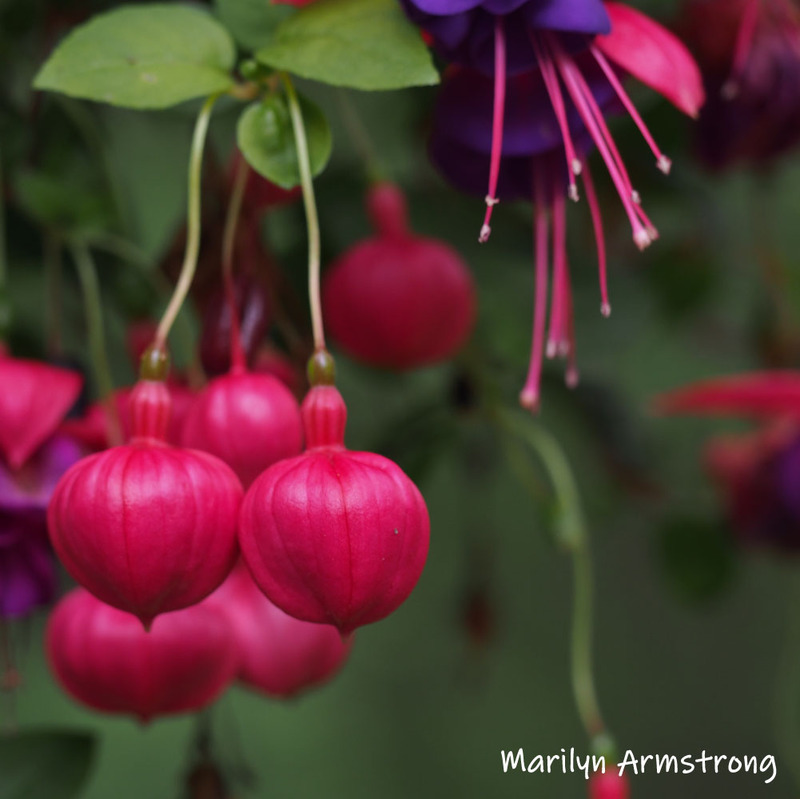 These may well be the last pictures of this years fuchsias. 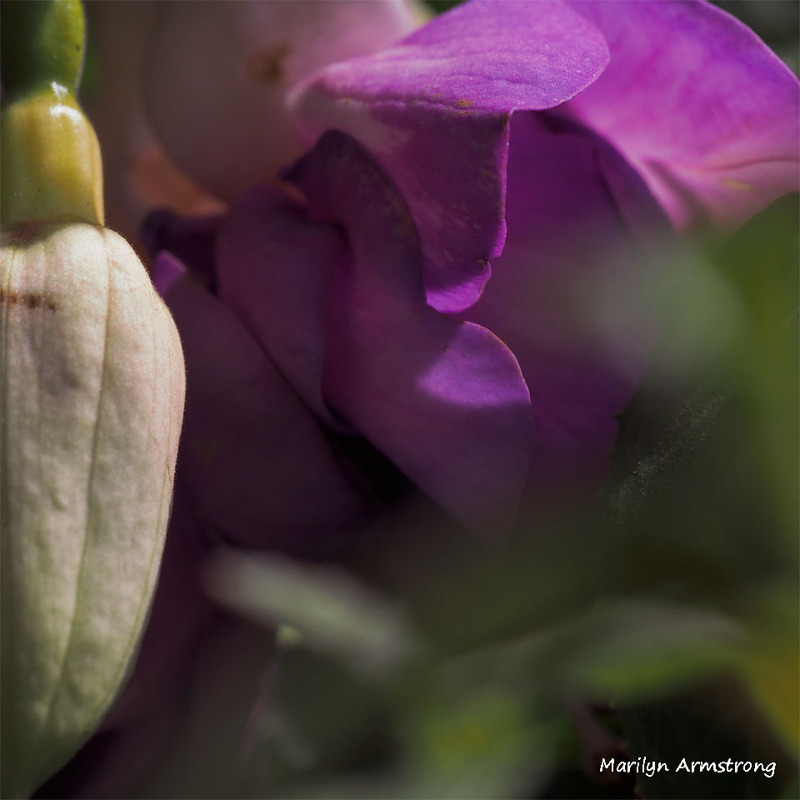 Against all odds, they have continued to produce flowers, even while the leaves fade. Their season is done, but like all living things, they fight for life. Right now, they are down on the deck where the wind cannot easily get to them. Even as they pass away, we protect them. And our windows. 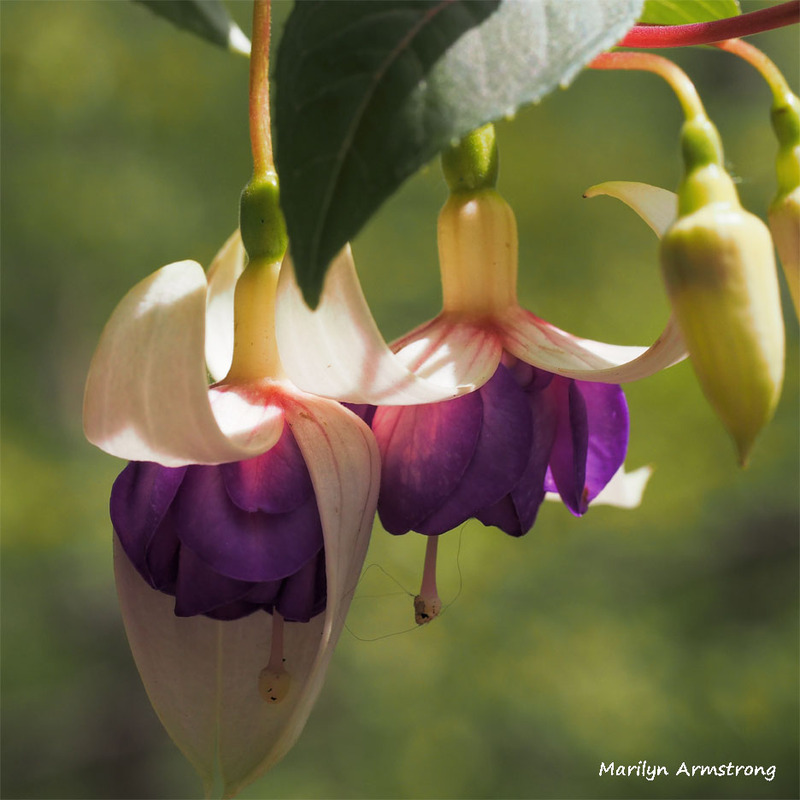 One of the fuchsia just hung there in the air, apparently suspended by nothing at all. Perhaps a piece of spider silk was holding it, but I couldn’t see it and neither could my macro lens. And, even though I messed around with the plants a bit, dead-heading the old blooms. The current flowers are old, but there are tons of new buds, so it’s good to clean out the old stuff. Make way for the new. This is the “off time” for flowers in this area. The chrysanthemums and other late summer blooms won’t be up for another week or two and the flowers that bloom twice haven’t set their second round yet. And anyway, I’m a terribly negligent gardener so I’m surprised anything blooms at all. I really am sorry. I was up early and didn’t sleep well. AND I had an 8:30 in the morning doctor appointment, and all I can think about now is how much going back to bed sounds like a good idea. My ambitious writing plans for the day are canceled. I’m going to waste the day playing Candy Crush and listening to audiobooks. Followed by some light television watching in the evening. My apologies to anyone who expected something significant or meaningful. Not today. Today has no meaning. Frivolity all the way. 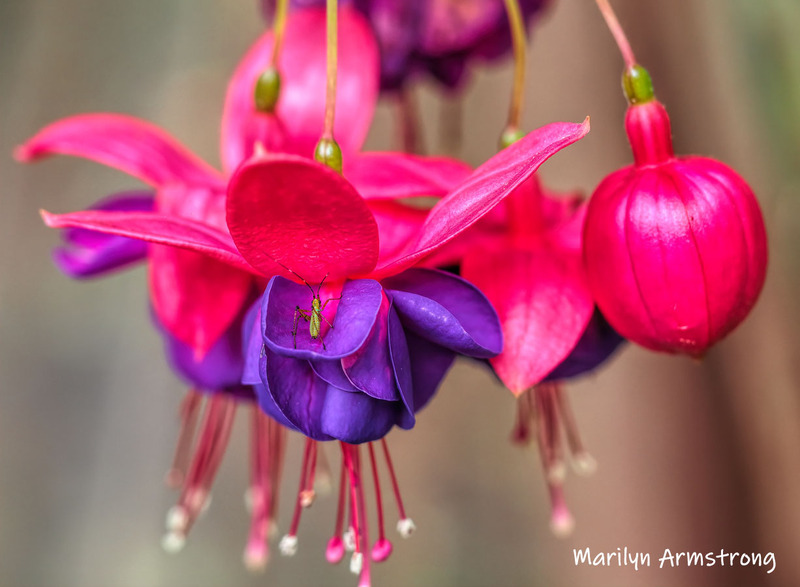 Meanwhile, please enjoy these new macro photographs of the lovely fuchsia growing on my back deck.